There are plenty of reasons for someone to fake his own personal information. If you are a lending company or a potential employer, how will you know that the person who is applying for a loan or a job is credible enough? How will you know if the person is truly financially capable of paying off a loan? Employment verification is the answer. 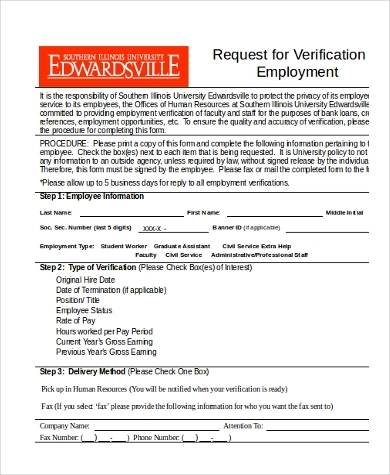 An Employment Verification Request Form is one of the many Employment Forms businesses use. 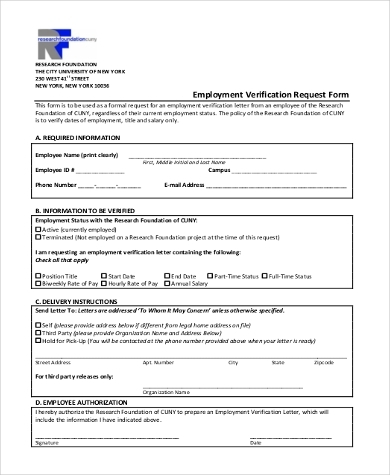 This is filled out by an employee who wishes to have his employment information disclosed to authorized parties for whatever purpose it may serve. 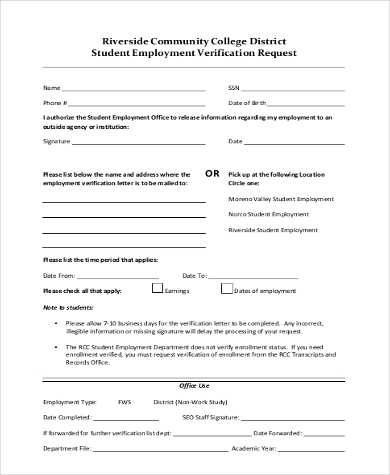 Student Employment Verification Request Form: This is used by prospective landlords and employers for verifying the employment of a student employee. 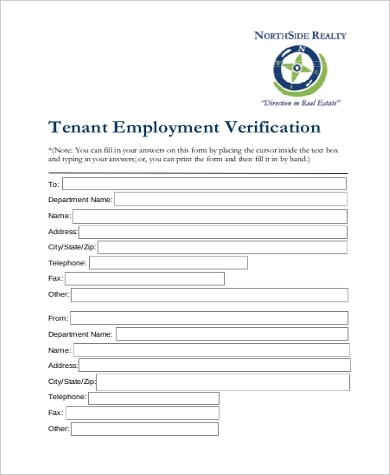 Tenant Employment Verification Forms: This is used for tenant screening by a landlord. They screen potential tenants to make sure that their employment is verifiable and legal. It also helps to verify the income of the tenant to make sure there will no issues with regard to paying the rent in the future. 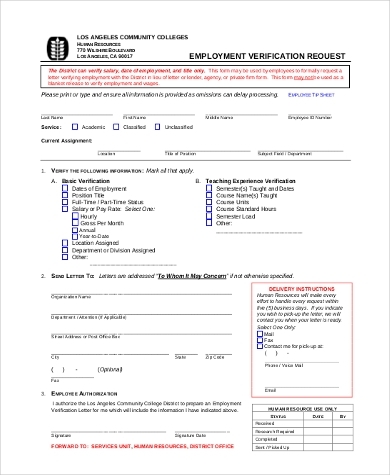 Previous Employment Verification Request Form: This is done by a current or prospective employer to verify the previous work experience of an applicant. This is necessary to ensure that the information provided by the applicant is credible. A person’s work experience is also important in determining his compensation package. 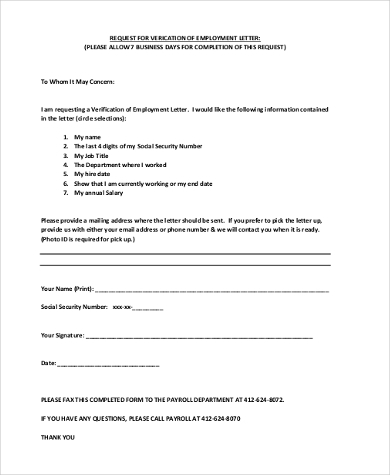 Aside from these types and purposes, an Employment Verification Request Form can also be submitted to an employer by a lending institution, creditor, or mortgage company to verify a person’s credibility and ability to pay off the loan he is applying for. What Information Can Be Verified? Prevent fraud: By doing background checks on potential employees, borrowers, or lenders, you can verify their identity and the information they have provided you regarding their employment. 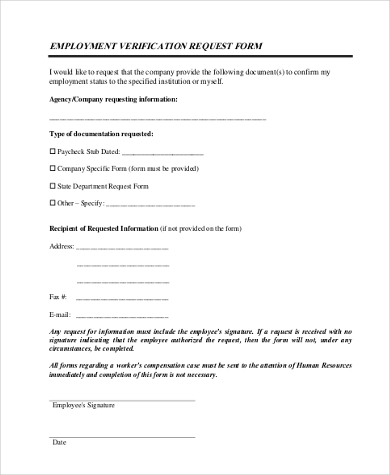 As early as the job application process, companies should be able to identify if any false information was provided so that they can withdraw the job offer, if necessary. Protect your intellectual property: Any company would not want any of their trade secrets or confidential company information to fall in the wrong hands. This can be very costly for a company and should be prevented. Avoid a bad hiring decision: It can be costly to hire people who are not qualified for the job, especially when the employer has offered them the position under the pretense that they are experienced but are actually not. As you can see, there are a lot of reasons for an organization to verify a person’s employment information. You would not want someone who is not credible enough to be a part of your organization. Integrity should always be preserved, lest you suffer the costly consequences. 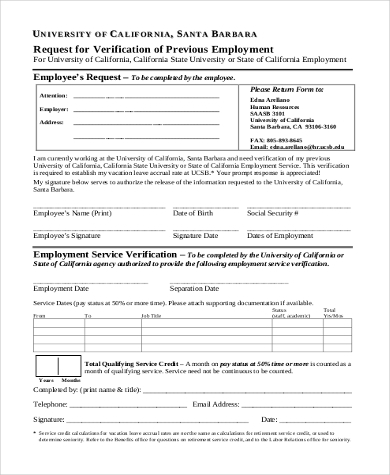 Aside from Employment Verification Request Forms, you may also use Job Verification Forms to verify a person’s employment status.